Penn State has most of its 2017 football recruiting class on campus this weekend and appears to be on the verge of making a big addition to that group early this week. After hosting Maryland’s Tariq Castro-Fields last weekend, the Nittany Lions appear to have become the team to beat for the four-star cornerback. Penn State analyst Sean Fitz, 247Sports national recruiting coordinator Steve Wiltfong and Maryland recruiting insider Jeff Ermann all predicted in the last few days that Castro-Fields will pick Penn State when he announced a college destination on Monday. Ermann’s prediction might be the one of which to be the most mindful, as the Terrapins along with Alabama comprise the three finalists for Castro-Fields. A high school teammate of Penn State defensive back Zech McPhearson at Riverdale Baptist, Castro-Fields would be the fourth cornerback and the 20th member of this Nittany Lion recruiting class. However, he would add something, as his length and size at 6-foot-1, 173 pounds makes him bigger than Lamont Wade, Donovan Johnson and D.J. Brown and is more in line with the kind of corner James Franklin and his staff usually like to recruit. Coincidentally, Castro-Fields and Wade both share the same birthday: Jan. 14. Meanwhile, with a week and a half to go before signing day, Penn State, as is its usual practice, brought most of its verbally-committed recruits up for a mass official visit. Eleven members of this year’s class are on campus for their officials, where they were joined by the four early enrollees in this class. The other four members of the class who already had taken their official visits also were expected to be on hand. Of that assemblage, the most vital visit is that of Indiana receiver Mac Hippenhammer. Hippenhammer has been committed to the Nittany Lions since mid-July, but Notre Dame recently offered him a scholarship, and the Fighting Irish are considered to have been his dream school. Penn State is trying to lock him up this weekend to deter him from making an official visit to South Bend next weekend. In the event Hippenhammer flips to Notre Dame, the Lion coaches are remaining alert for a wideout to fill the slot. Franklin reportedly visited Henry Ruggs, a high four-star prospect from Alabama, a few days ago, and the Lions were hoping to get him to take an official visit before signing day, although most believe he’ll stay in state and sign with the Crimson Tide. Pittsburgh Central Catholic guard commit C.J. Thorpe also is slated to take an official visit to Michigan next weekend, but most feel it’s highly unlikely the Lion legacy recruit winds up anywhere other than University Park. Along with all the committed recruits, Penn State also is hosting Maryland defensive lineman Joshua Paschal this weekend. A four-star recruit, Paschal is verbally committed to Kentucky, and he has family ties there — his brother is a graduate assistant. Defensive line is considered an area the Lions would like to address, if possible, with the final two or three scholarships available in this class. Penn State still is involved with Virginia four-star Elijah Conliffe and New Jersey three-star Corey Bolds. In addition, the Lions were expected to be entertaining several preferred walk-ons, including Central Mountain safety Justin Neff. Penn State also extended walk-on offers to State College’s Pete Haffner last week, according to Fitz, as well as receiving word that Mars linebacker Max Chizmar — whose father, Brian, played for the Lions in the 1980s — was going to join the class as a preferred walk-on. Most recruiting analysts thought Penn State would like to get another linebacker in this class — they have three, presuming Virginia’s Dylan Rivers, another of this week’s official visitors, doesn’t make a last-second decision to switch to Virginia Tech. The consensus was that the Lions had a good shot at Maryland four-star Nathan Proctor, despite his own verbal commitment to the Hokies. However, according to Fitz, the Lions delayed Proctor’s scheduled official to Happy Valley this week. They also seemed to be turning up the heat on Virginia four-star linebacker Ellis Brooks. Brooks is at Oregon this weekend and appears to be looking at Penn State and Michigan as possible destinations for his final official a few days before he signs his letter-of-intent. Before this weekend’s visits, the Nittany Lion coaches spent the week making trips to check in with recruits and high school coaches across the country. James Franklin was in Altoona on Friday and stopped in at both Altoona Area and Bishop Guilfoyle. Altoona has a pair of underclass linemen who might interest the Nittany Lions, junior Jayvion Queen and sophomore Gaige Hill. 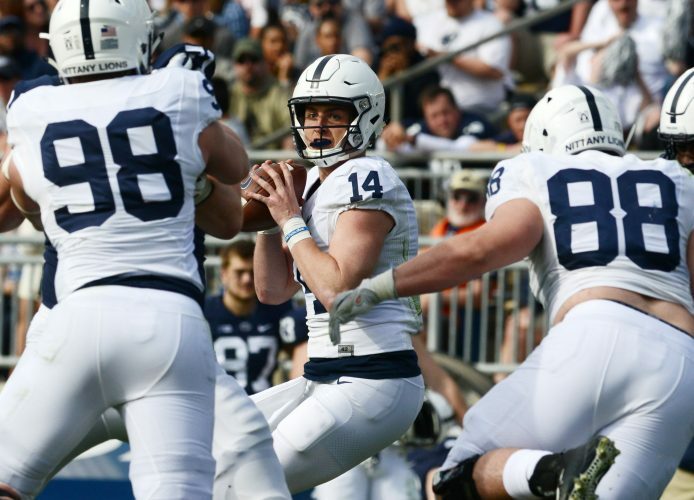 Penn State has pursued Guilfoyle seniors Luke Frederick and Evan Chadbourn as preferred walk-ons, and sophomore place-kicker/punter Kolton McGhee seems to be someone the Lions have been eyeing up for the 2019 recruiting class.